We keep a careful record of service days and do a boiler wash, staybolt inspection, and water level indicator passage check no more than every 31 days. It actually usually ends up at 30 days- just before the picnic. It also happens following Christmas trains- so it happens twice a year. Nearly all lubrication points are oil, and are on a daily cycle. Every now and again we drop the oil cellars to check the pads. Usually take up on drive box wedges once a year and rod wedges about twice a year. #10's Picture on NERAIL today, back during the days at Edaville and before Pleasure Island. It looks like the photo was taken before she received the new boiler. Note the extra pipe above the hand rail on top of the boiler on the engineman's side. Seeing that she's sitting on "snap track" I wonder if that photo was taken before she went on her diet to slim down from 30 to 24 inch gauge. Looks like the location is right in front of the Edaville shop. What is the difference in "engineer" and "engineman"? When I used to receive the Seaboard Coastline employee magazine, it would mention those two designations in the obituaries. I'm guessing that it has something to do with union designations. I would guess that an "engineman" is a fireman. Engineer and Engineman are interchangable terms. 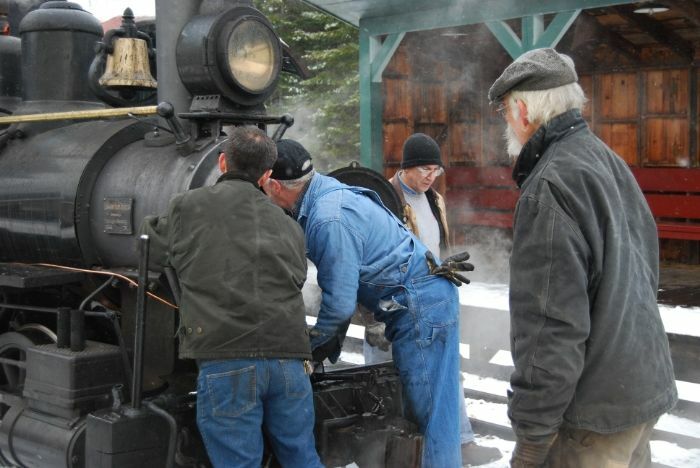 Many railroads chose to all their engine crew "engineman" because of the fact that they were not engineers in the same sense that a mechanical engineer or electrical engineer is, as they "design" things....not operate them. As far as Union designations go...it is "The Brotherhood of Locomotive Engineers" but the firemen's union was the "Brotherhood of Locomotive Firemen and Enginemen." Most railroads required that you belong to a union, national in scope....but they did not tell you "which" union you must belong to. The BLE had members who were both firemen and engineers, and just considered firemen to be in the same craft, just not yet promoted to engineer. The Bof LFE also had members in both positions, they just called engineers enginemen. A term probably frowned upon by the female engineers of today. Bill, I think you're right. In reviewing the photo again, the temporary track looks like it could be 30" gauge. Also, the crank pins don't look as long as they are now so the photo could show the locomotive prior to re-gauging. If true, and if the engine still has the original boiler the photo was probably taken shortly after the Vulcan arrived at Edaville. Jock, My use of the term "engineman" is from habit. It stems from having family members who worked for the Pennsylvania RR where the engineer was known as the engineman. The Lehigh Valley was the same, calling them enginemen. And the LV also had "cabin cars" not cabooses too. But then the LVRR was owned by the PRR, hence the same terminology. I was wondering if it was still 30" gauge, too. Edaville cut and welded in a 'kink' in the mainrods to accommodate the 3" difference on each side. When we rebuilt her, Jason chose to scrap those and use a longer pin with new, straight rods. I can't see from that picture if the rods have that modification, maybe someone else can chime in. Sure looks like it hasn't been "narrowed" yet, though. It looks like that pipe would be the steam to the cylinders, but that would be an odd way to do it? And who is that young girl in the cab?? I'm curious. What is the new drafting arrangement on #10 and how did she do? We added a stack extension including a bell mouth flare, angled the nozzles toward the stack choke center and installed new nozzle inserts that converge slightly then diverge gently, simulating an injector or ejector steam nozzle. The testing was not as comprehensive as we had hoped but it did well enough that we will use all the modifications for Victorian Christmas. The crew swapping out exhaust nozzles. The new stack extension. The two curved pipes are the wishbone pipes coming out of the dry pipe behind the stack extension and feed the valve chests. The exhaust nozzles are next to each other in the center. 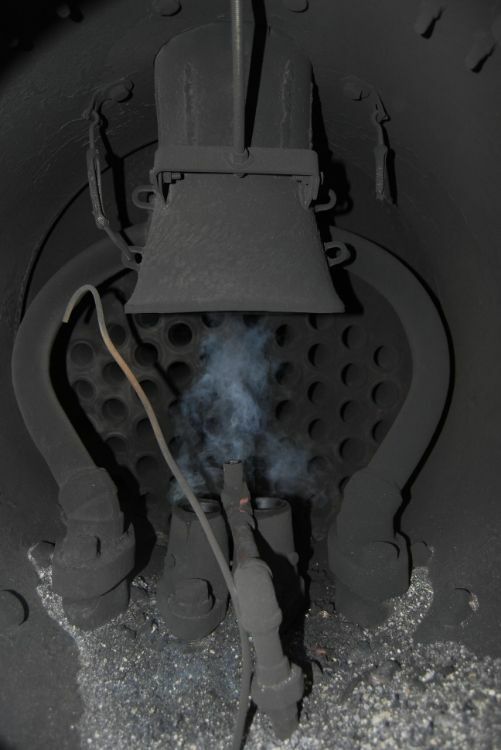 Blower piping comes into the smokebox closest to the camera. The random copper tube is a temporary vacuum probe to measure differences in the drafting arrangements. Smokebox netting still has to be added. Please ignore the melted turnbuckles, I put aluminum bodied ones in by mistake. Looks like worthwhile improvements. I take it there was not a stack extension, previously. I would think the new arrangement should improve economy as well as increase boiler output. I've always thought that #10 was an ideally sized locomotive for the typical needs of the W.W.&F. You guys do great work!